Battles In Michigan’s 7th District And 1st District Are Drawing The Most Spending, And More Is Coming. 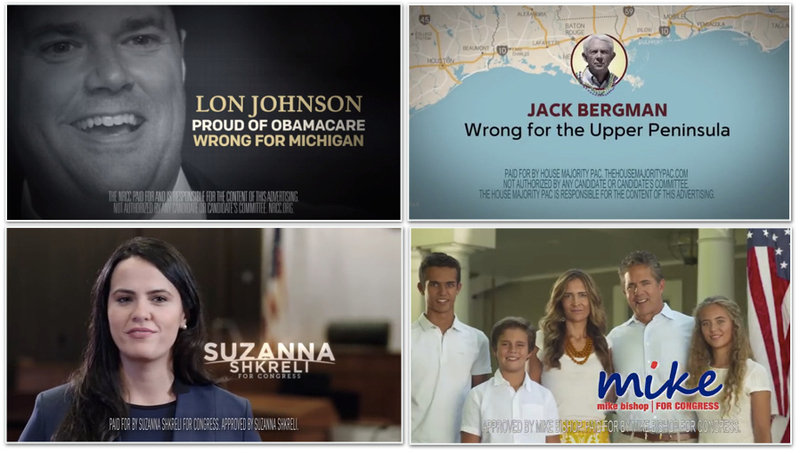 LANSING — Campaigns and their supporters have already spent an estimated $3 million on broadcast TV ads this fall in four Michigan races for the U.S. House. The estimate is through Monday, Oct 3, more than a month before the election. The estimate is based on the Michigan Campaign Finance Network’s analysis of Kantar Media/CMAG ad tracking data and advertising orders filed by broadcast TV stations with the Federal Communications Commission (FCC). The wide majority of that $3 million in ad spending — about $2.6 million — has been focused on races in the 7th District in Southern Michigan and in the 1st District in Northern Michigan. Smaller amounts have been spent in the 6th District in Southwestern Michigan and in the 8th District, which includes Ingham County, Livingston County and a portion of Oakland County. The following is a summary of who’s been running ads in these races and how much they’ve spent so far. The 7th District, where incumbent Rep. Tim Walberg (R-Tipton) is trying to fend off a challenge from State Rep. Gretchen Driskell (D-Saline), has seen the most TV ad spending in the general election so far. The estimated total as of Monday, Oct. 3, was $1.505 million. Driskell’s campaign, which has been running ads in the Detroit and Lansing markets, has spent the majority of that at about $904,000 as of Monday. Walberg’s campaign and the National Republican Congressional Committee (NRCC) have run about $601,000 in ads. Driskell has focused her spending on ads criticizing Walberg’s stances on trade policies. Walberg has spent the most on an ad that attacks Driskell for missing road funding votes in the State Legislature and that ties the Democratic candidate to U.S. House Minority Leader Nancy Pelosi. Both candidates' campaigns and outside groups are helping to drive broadcast TV spending past the $1-million mark in the open 1st District. With the spending by outside groups set to continue, the 1st District race could soon surpass the 7th in total ad spending. In the 1st, retired Lt. Gen. Jack Bergman, a Republican, is trying to keep the seat in GOP hands against former Michigan Democratic Party Chair Lon Johnson. According to TV ad orders disclosed to the FCC, the NRCC was scheduled for about $475,000 in ads in the 1st District that would have run through Monday, Oct. 3. Bergman’s campaign was scheduled for about $64,000 in ads since the end of his competitive primary race through Monday, Oct. 3. Over the same time period, Johnson’s campaign was scheduled for about $316,000 in ads while the Democratic Congressional Campaign Committee (DCCC) was scheduled for about $227,000. However, the spending continues to move upward in the 1st District, where the NRCC, the DCCC and the House Majority PAC, a group that supports Democrats, all are trying to influence the race. The NRCC, the DCCC and the House Majority PAC have all reported independent expenditures in the 1st to the Federal Election Commission (FEC). These are expenditures that are supposed to be made without coordinating with the candidates themselves and that have to be reported to the FEC soon after they're made. As of Friday morning, the NRCC had reported $895,787 in independent spending against Johnson, including TV ads and polling. As of Friday, the DCCC had reported $408,558 in independent spending against Bergman, and the House Majority PAC had reported $104,934 against Bergman. Those reports add up to $1.4 million in independent spending. All three groups had reported spending money as recently as this week in the race. In a rematch of 2014, U.S. Rep. Fred Upton (R-St. Joseph) is facing another challenge from professor Paul Clements, a Democrat from Kalamazoo, this year. A former state lawmaker, Lorence Wenke, is also running in the district as a Libertarian. As of Monday, Oct. 3, Clements’ campaign had aired an estimated $137,000 in broadcast TV ads. Upton’s campaign had aired more ads, at about $151,000. In 2014, Upton got 55 percent of the vote to Clements’ 40 percent. After the original Democratic candidate Melissa Gilbert withdrew from this race, Democrat Suzanna Shkreli, an assistant Macomb County prosecutor, got a late start against incumbent Rep. Mike Bishop (R-Rochester). But Shkreli’s campaign began running broadcast TV ads in September. As of Monday, Oct. 3, she had run about $184,000 in ads in both the Detroit and Lansing markets. Bishop’s campaign began airing broadcast TV ads earlier this week but they came after Monday, Oct. 3.